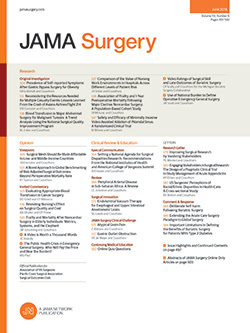 Archives of Surgery will publish a special theme issue in October 2007 on bariatric surgery. Papers submitted by April 1, 2007, will have the best chance for inclusion in this issue. We would like to review articles on clinical outcomes, physiological changes, new techniques, and complication management. We would like to see articles from many centers across the country and around the world. Please consult our Instructions for Authors at http://archsurg.ama-assn.org/misc/ifora.dtl for submission information.